These are the people who are currently associated with the forest ecology group along with a list of some past and honorary members. My move from Nottingham to Ireland in 2018 has complicated matters so for the time being we’re all over the place. I’m reluctant to call it ‘my’ group, or ‘The Eichhorn lab’, mainly because I don’t see it that way at all. It’s more a set of people who are all passionately interested in how forests work, and who I’m lucky enough to be able to work with. If you’d like to join us then get in touch! Libertad Sánchez-Presa is a PhD student (from 2015) working on patterns of diversity in Mexican pine species. Did you know that there are more species of pine in Mexico than any other country? Working out the ecological and biogeographical causes of this are her main focus. She is still based at Nottingham. Her co-supervisor is Richard Field at the University of Nottingham, where she is staying to write up her thesis. Libertad recording trait data from conifers on the slopes of Popocatapetl in 2016 on the #PinaceaeGo trip (gotta catch them all). Hazel Wilson is a PhD student (from 2017) working not on trees but the role of litter in rivers. She is investigating how even man-made objects can act as habitat for aquatic organisms, creating new structures in rivers that can otherwise be very homogeneous due to management to increase flow. The project may sound a bit out of my usual range of interests, but actually the core is how habitat architecture influences diversity, and therefore an underwater shopping trolley isn’t that different from a tree (trust me). Her main supervisor is Matt Johnson in the University of Nottingham, where she is based in the School of Geography. Amy Gresham is a PhD student (from 2018) studying how deer interact with forest structure. Her project in North Wales is taking advantage of a recent invasion of fallow deer, allowing us to investigate not only how forest structure changes before and after the arrival of deer, but also how individual deer respond to these forests in terms of their movement patterns. Her main supervisor is Graeme Shannon at Bangor University. A lot of people have been through the group over the years, all of whom have gone on to great things, both outside and inside academia. This list isn’t comprehensive (yet). If you’re reading this and notice that you’re missing then please hassle me, preferably accompanied with a photo and an update on what you’re doing these days. 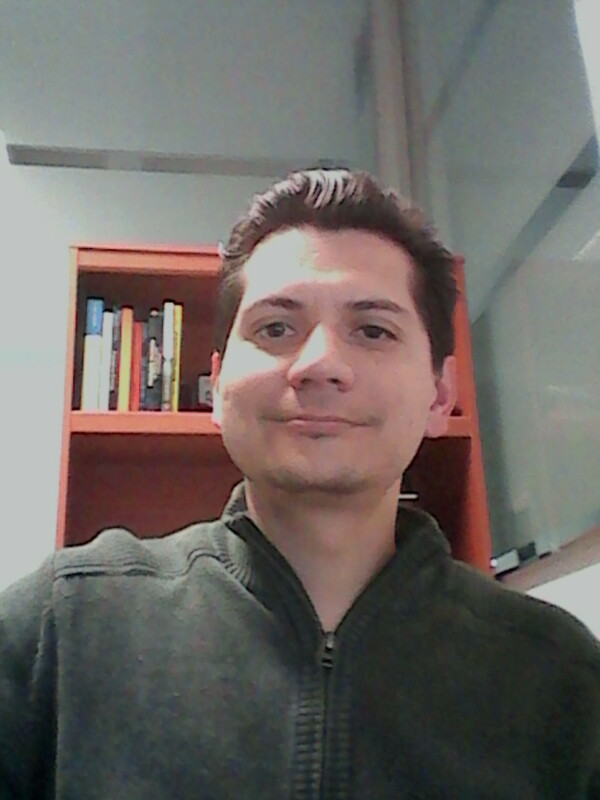 Dr Jorge Velazquez now has a faculty position at the University of Puebla in Mexico, but before that was a post-doc working with myself and Juan Garrahan in the School of Physics and Astronomy. Prior to that his PhD was in astrophysics. His project was on understanding how spatial organisation of communities might lead to coexistence, but has extended into a much more wide-ranging and ongoing research program (see research page). He now specialises in telling ecologists why their models are wrong. These days I Jorge and I mostly see each other like this, through Skype. Dr Olivia Norfolk worked for her PhD (completed 2015) on the conservation value of traditional agroforests maintained by the Bedouin of South Sinai, Egypt. She was co-supervised by Francis Gilbert. She has a lectureship at Anglia Ruskin University in Cambridge. Dr Syarifah binti wan Mohammad Kamariah (known to all here as Qamar) completed her PhD thesis in 2015 working on the rain forests of Northeast Queensland. Her research focussed on a long-term plot dataset maintained by CSIRO Atherton, examining how cyclone damage alters the structure of these forests. She’s now back working as a lecturer in the UPM campus in Bintulu, Malaysia. Dr Ed Tripp wrote his PhD thesis on the composition and ecosystem processes of British heathlands, co-supervised by Peter Crittenden. He’s now working for Nottinghamshire Wildlife Trust as an education officer. Dr Lauren Gough completed her PhD on the spatial patterns of a shrub endemic to the central caldera of Tenerife. The aim was to assess how the spatial population structure varied between lava flows of different ages or composition. She now works for library services at the University of Nottingham. Her co-supervisor was Richard Field. Dr Joe Ryding was a part-time PhD student alongside his job as a professional surveyor; his background is in engineering. His project involved surveying 40 woodlands across England as part of the WoodMAD project to investigate how deer and management affect the whole three-dimensional structure of forests. The project was in collaboration with Martin Smith in the Faculty of Engineering at Nottingham. He is currently working for the Donkey Sanctuary in Exeter. 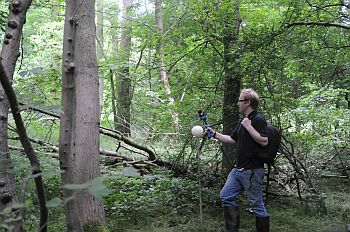 Joe trialling the Zeb1 hand-held laser scanner in Kirton Wood, Nottinghamshire. Saifon Sittimongkol was a PhD student on secondment from Prince of Songkla University in Thailand. 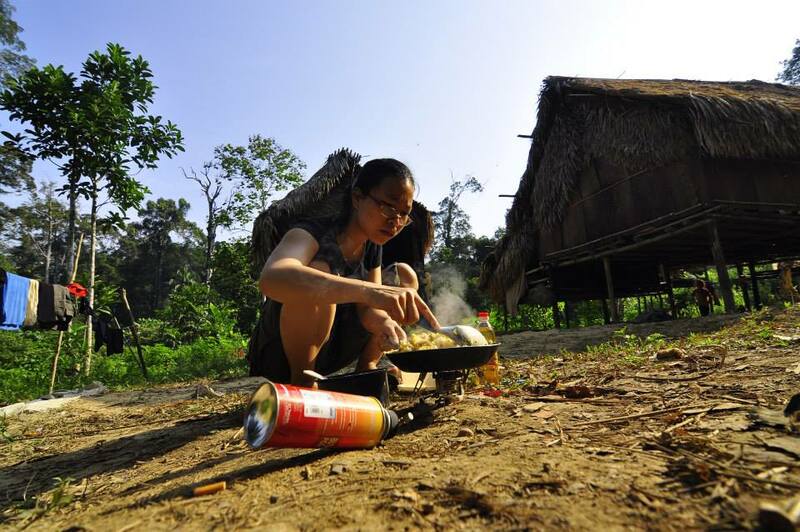 Her project was with the Chewong, an indigenous forest-dwelling group living in Krau Wildlife Reserve, Malaysia. She investigated their shifting agricultural system and its effects on forest regeneration and composition. More recently this has taken on elements of ethnobotany and anthropology in collaboration with Hilary Gilbert at Nottingham. She’s completing corrections to her thesis. Even while in the field Saifon maintains extremely high standards of cooking. Jonathan Moore was an MRes student studying how forest fruit gardens maintained by the Chewong people influence the abundance and diversity of frugivorous vertebrates. He’s still in Malaysia working as a field technician on a number of projects. His co-supervisor was the elephant man Ahimsa Campos-Arceiz. If you need someone to run a field project in the middle of nowhere, particularly if it involves camera trapping, then you should probably offer him a job. 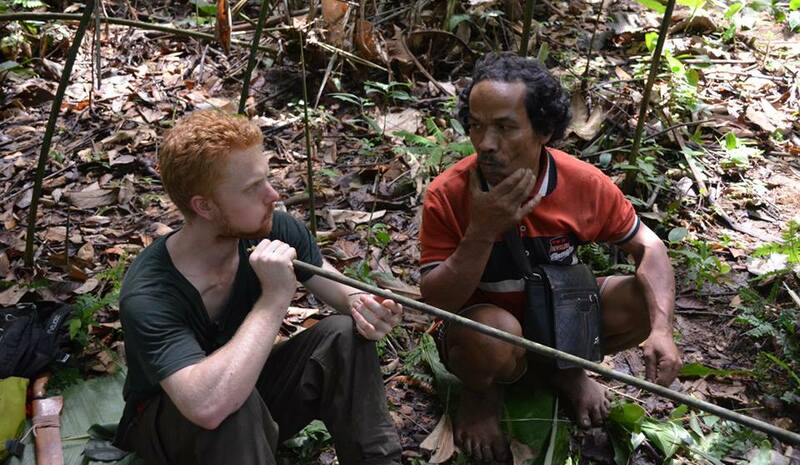 Jon learning how to use a blowpipe from Tok. He’s pretty handy with one too. Stine-Marie Simensen completed her MRes thesis on the conservation of Lundy cabbage, an island endemic confined to one small corner of Lundy Island. She’s now back in Norway working as a librarian. Yvette Harvey-Brown also worked on Lundy cabbage for her MSci, in her case looking at a 20-year population time series and trying to establish the main drivers of population change. She’s also an extremely talented botanist and currently works for Botanical Gardens Conservation International on the Global Trees Campaign, which is awesome. Danielle Richards completed her MRes on the overwintering beetle communities of grass tussocks, establishing that their spatial patterning influenced the composition of beetles found within them. She’s a passionate entomologist, now working as a school maths teacher in Lancashire but constantly enthusing her students with a love and awareness of nature. In recognition of this she won the Royal Entomological Society’s Goodman Award in 2018. There are a few people here who we work with closely, and some of whom have spent time with us here in Nottingham. Gilbert Baase Adum is the founder, executive director and figurehead of Save The Frogs! Ghana, an NGO devoted to amphibian conservation. Gilbert and I have been working together since 2010, when he was a student on a field course I was teaching in Tanzania. He has since visited Nottingham twice on research placements and we have a number of ongoing projects. The core question underlying our collaboration is how forest structure influences amphibian communities in Ghanaian forests. 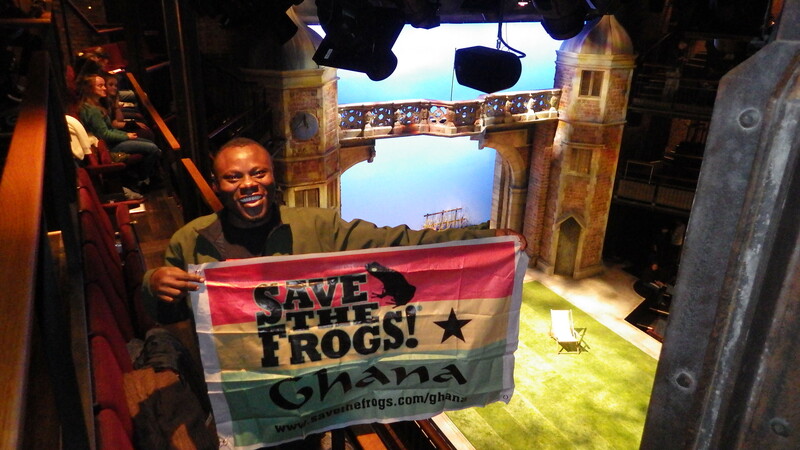 Wherever Gilbert goes, even in the theatre in Stratford-upon-Avon, he wants to tell people about frog conservation. 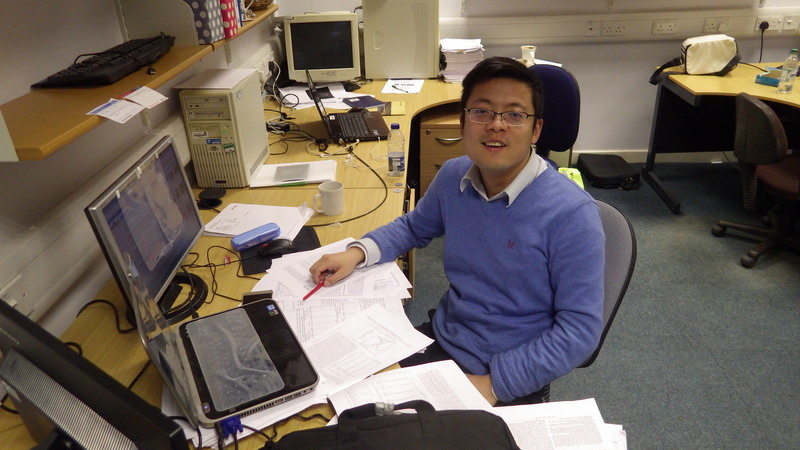 Dr Yun Ting was a research fellow on secondment from his position at Nanjing Forestry University. His background is as a computer scientist and he worked with point-cloud data from terrestrial laser scans of forests. The main project was to find a computationally-efficient means of directly estimating total leaf area of trees from LiDAR data. This project was in collaboration with Martin Smith in the Faculty of Engineering at Nottingham. Yun Ting in his natural habitat. Why use only one screen when you can use three?